Where will you find the sleekest and most futuristic stadium in the NFL? Not in New York City of Chicago, but in the desert in Glendale, AZ. State Farm Stadium is home of the Arizona Cardinals, the first stadium they have not had to share with another tenant. The Cardinals have a long history that dates to 1898 when the football club was formed in Chicago. Here they played at Comiskey Park, home of the Chicago White Sox (MLB). In 1960 they moved to St. Louis where they shared Busch Stadium with the St. Louis Cardinals (MLB). After the 1987 season they moved to Arizona and Sun Devil Stadium, home of the Arizona State Sun Devils. Through the late 1990s the Cardinals began seeking a new stadium. 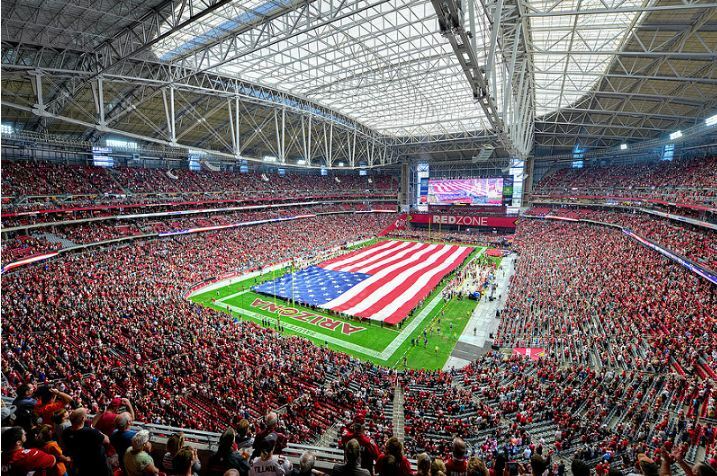 After several years of debate, in August 2002, the Arizona State Tourism and Sports Authority voted to build a new retractable roof stadium in Glendale, AZ for the Arizona Cardinals. At a cost of $455 million, the stadium not only features a retractable roof, but features a retractable side and field that moves in and out of the structure. The stadium is built on 28 acres that is owned by the sports authority. The Cardinals paid for 25% of the stadium, $109 million, including cost overruns and the state Tourism and Sports Authority paid for 75% of the stadium. The Cardinals also bought the land for the stadium at a cost of $18.5 million. QB Kurt Warner completes 401 passes and 30 passing touchdowns in 2008. 337 rushing attempts by Edgerrin James in 2006. The retractable roof at State Farm Stadium is comprised of two 180-feet long by 240-feet wide retractable panels that close to allow for air conditioning during the hot summer months and open during the cooler months to take advantage of the Valley’s abundant sunshine. The fabric roof allows light to fill the stadium and provides an open, airy feel even when the roof panels are closed. The roof system is designed to open or close in approximately 12 minutes. State Farm Stadium features a unique rollout natural-grass playing field, contained in a single tray measuring 234 feet wide by 403 feet long and weighing a hefty 18.9 million pounds. It is the first completely retractable field in North America. The field is positioned inside the stadium on game days to offer the preferred natural-grass playing surface for football and outside the stadium the remaining 350+ days of the year to receive the needed sunlight and water to grow. A total of 462 steel wheels, riding on 13 parallel steel rails are used to slide the field tray in and out of the facility. Construction of the stadium began in July 2003. Originally expected to be completed in time for the 2005 NFL season, the stadium opened on August 12, 2006, when the Cardinals played the Pittsburgh Steelers in a preseason game. The Cardinals played their inaugural first game at the stadium when they hosted the San Francisco 49ers on September 10, 2006. The stadium has a very modern, futuristic look and seats 63,400 fans for football. State Farm Stadium was originally known as the University of Phoenix Stadium from its opening through the 2017 season. Prior to the start of the 2018 season it was renamed after the Cardinals agreed to an 18-year naming rights deal with State Farm Insurance. The capacity can be expanded to 72,800 for other events at the stadium including the Super Bowl. 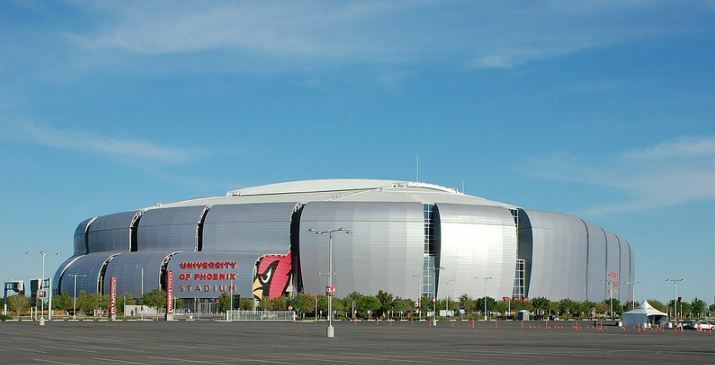 Not only is the stadium the home of the Arizona Cardinals, but has hosted Super Bowl XLII in 2008, Super Bowl XLVIV in 2015, NCAA Final Four Championships, annually hosts college football’s Fiesta Bowl and will host the Super Bowl in 2023.